By now it’s the middle of spring even if the month of May sends us lots of rain and cold temperatures and my last post from February feels like ages away. That it took me that long to publish a new recipe and write a new post has its reasons. Finally I can spill the beans that we’re expecting a second little bundle of joy. 🙂 I’m now in my second trimester and our little one will make its entrance probably at the beginning of September. The first four months I was constantly nauseous and couldn’t eat or cook. Let alone smell food or just look at food pictures. Luckily that has subsided now and finally I can be back on working on new recipes and my very neglected blog. 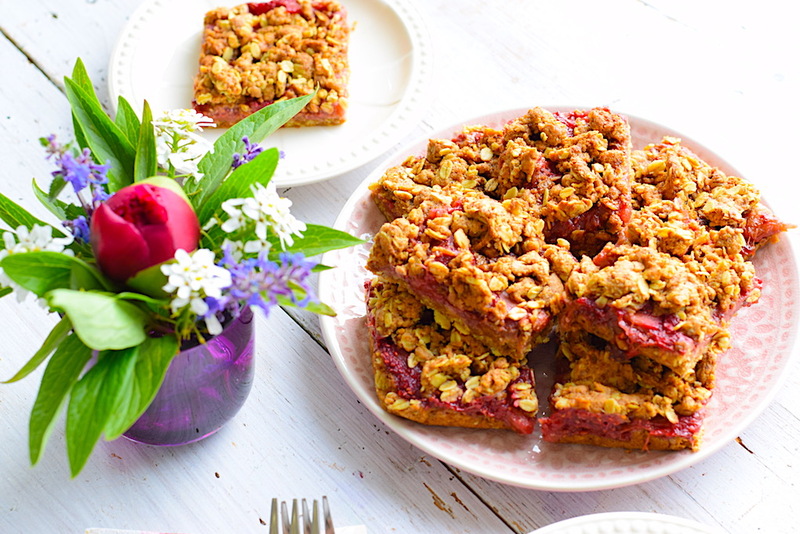 Since it’s spring and typical for this season here comes a recipe for delicious rhubarb-raspberry squares. Every year I long for rhubarb season to come around as I love using rhubarb in cakes, compotes and treats. I simply adore its fruity and tangy flavour. Apart from mineral nutrients like iron, potassium and phosphorus rhubarb contains a lot of vitamin C and fiber. These little crumb squares are vegan and contain lots of valuable fiber from the oats and wholesome einkorn flour I used in this recipe. If you haven’t used einkorn wheat flour so far I suggest you give it a try. It’s available in organic food markets and health food stores and one of the oldest crops cultivated. Closely related to wild wheat it contains much more nutrients, amino acids and fiber than regular wheat. If used in baking it adds a nice golden-brown colour. Wash and peel rhubarb and cut in pieces. Place in a pot along with raspberries, chia seeds, 1/2 tsp vanilla, xylitol or coconut blossom sugar. Bring to a boil and let simmer on low for about 8-10 minutes. Stir in between. Put aside. Preheat oven to 350 °F/180°C and line a rectangular baking dish with baking paper. In a mixing bowl mix oats, einkorn flour, coconut sugar reserving 1 tbsp, baking powder, salt and the other half tsp of vanilla. Add coconut oil and rub it in with your hands. Add oat milk and mix until you have a crumbly dough. You can use a kitchen machine for this as well. Press a little more than half of the dough into the prepared baking pan. 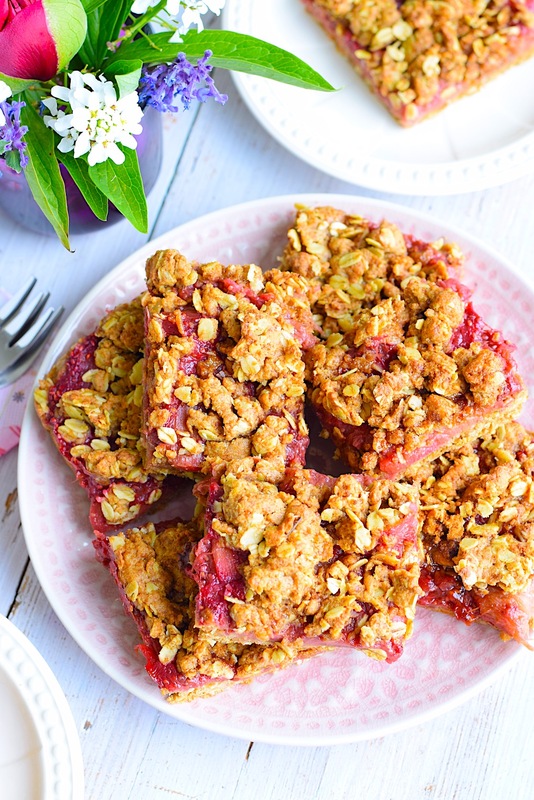 Spread the rhubarb-raspberry compote evenly on top and top with the remaining dough crumbs. Sprinkle with remaining tbsp of coconut blossom sugar. Bake on the middle rack for 15-20 minutes. Let cool, slice and enjoy!